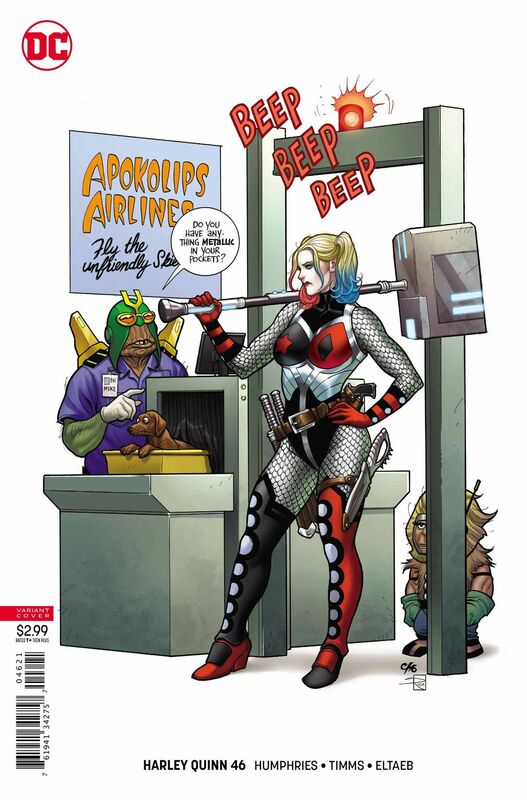 Harley Quinn #46 Review – AiPT! It’s Fury vs. Fury in a furious showdown! Harley’s tasked with bringing in Petite Tina—except, turns out, shes not quite so petite! It’s Fury vs. Fury in a furious showdown! Harley’s tasked with bringing in Petite Tina–except, turns out, the reason she failed as a Fury is that she’s not furious enough! She’s kind, good-hearted and oppressed–and now Harley’s the one oppressing her. Harley’s caught between a rock and a hard place: give up her amazing superpowers and free Tina and the other oppressed Lowlies, or keep bashing stuff with a super-hammer and having fun. What’s a girl to do? Harley Quinn #46 by Sam Humphries and John Timms continues the past issue’s trend of being a real fun time. The issue starts exactly where the previous ended, with Harley fighting Petite Tina (who isn’t very petite at all). The actual fight only lasts about four/five pages which is pretty good as long drawn out fight scenes that last an entire issue are much too common these days. Humphries also brings in some interesting new things to Apokolips this issue. The first being The Splinter of Destiny that powers the second thing, the Subjukator which is a gigantic statue of Darkseid with the power of something? Anyway it just seems like a giant vanity statue with world conquering abilities that is built to help Darkseid by Granny Goodness. Seeing Harley be on bad terms with the other Furies as they don’t see her as one of them while Harley is also homesick and missing her friends was a nice facet of the issue. Humphries also continues with Harley’s recent preoccupation with helping people, having it be a major plot point in the issue when it comes to the Subjukator. My only real gripe that isn’t really a gripe is the fourth wall breaking. It’s not an awful thing and it’s actually used pretty well in this issue in order to recap at the beginning (honestly DC could benefit from recap pages) but it still feel kind of out of place and personally I think it’d be better off without it because it stumbles into just kinda weird dialogue around other characters regarding it. A solid issue with fun character moments and visually striking art. Humphries writes another fun issue. Timms draws a fantastic Apokolips with some great action scenes. Harleys personality is one you can really get along with..
... except the fourth wall breaks which feel a little too tongue in cheek.